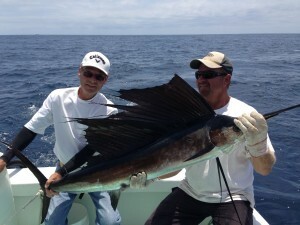 Sailfish: The sailfish is probably the most sought after gamefish in the deep sea waters off the east coast of Florida. Known for both their acrobatics and never say die attitude on the line, anglers since the days of Hemingway have been chasing sailfish to prove their medal as sport fisherman. Sailfish Fishing Tips: Most sailfish are caught trolling, much the same as mahi. Occasionally, they are caught while live baiting and sometimes they are found on bait pods where they can be sight fished with pitch baits. Once brought to boat side, we usually get a few quick pictures and release the sail to give another lucky angler the fight of his or her life. Have a question or ready to book? …We had an amazing time! Within minutes of our first cast off we had two fish in the boat – a suckerfish, my son caught and a King fish. Within moments of that we had a Sail Fish on the line, that took some time to get in – but definitely a once in a lifetime trip for this family from Nebraska!